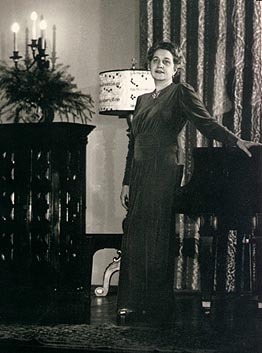 Mildred Couper, prominent American composer and pianist, was one of the first musicians to experiment with Quarter-Tone Music. She was based in Santa Barbara, California, but her music and influence were felt around the world. Born in Buenos Aires, Argentina; educated in Italy, France and Germany; married to American expatriate artist Richard Hamilton Couper; she spent her early married life in Rome, Italy. She studied in Europe at the Karlsruhe Baden Conservatory, and later with Moszkowski, Sgambati, and Cortot. At the outbreak of World War One she and her family fled to New York City. Here she taught piano for nine years at the David Mannes Music School. She came to California in 1927. Establishing a studio in Santa Barbara she started her quarter-tone experiments, the first work in this medium being a ballet, "Xanadu," which was performed in the production of Eugene O'Neill's "Marco Millions" in the Lobero Theatre. Besides quarter-tone works, Mildred Couper has written incidental music for plays, and also a Dance-Opera "And on Earth Peace", to words by Scottish-Argentine artist Malcolm Thurburn. She was a friend of Harry Partch and Henry Eichheim, and worked with gamelan and microtonal music. Active in Santa Barbara as President of the Music Society, she was one of the founders of the Music Academy of the West, first female faculty member of the Cate School in Carpinteria, worked with Henry Cowell, and often had concerts in her large Spanish-styled home with singers Nadia Boulanger, Lotte Lehmann, Madeleine De Bryas, cellist Gregor Piatigorsky, and the Paganini Quartet with Henri Temianka, Charles Libove, David Schwarz, and Lucien Laporte. This site contains a personal Autobiography, a full Biography (in PDF), research Links, a list of Music Scores, views of her Estate in Mission Canyon, and additional Photographs. Mildred Couper was a frequent soloist and pianist for concerts across the United States, from Nantucket to the Los Angeles "Concerts on the Roof" series. A number of News Articles mention her works. Please click on the underlined words for additional information.